Why is it important to integrate the different ways of knowing about tornadoes? After all, isn’t safety the only important issue? And if it is, then why not just find out what the experts advise people to do and leave it at that? Gust clouds. 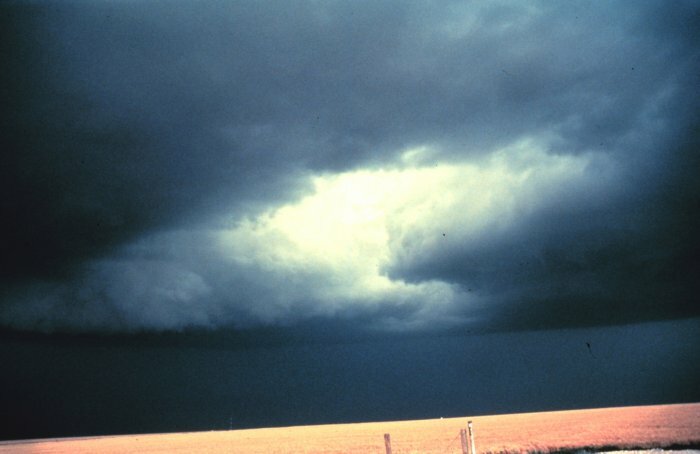 National Severe Storms Lab photograph. With that single statement, Authority moves from the “expert” to the individual at the scene. In other words, the experts are telling you that because of genuine variation in storms, variation of environments in which you may find yourself, and the inherent complexity of the situation, there is no single set of “tips” you can learn and rely on to stay safe. What you should do DEPENDS.
. . . whether you are inside or outside.
. . . what kind of structure you are in.
. . . whether you are in open country or a city.
. . . whether or not you are in a car.
. . . how the road you’re on travels compared to the storm’s direction.
. . . what kind of up-to-date information about the storm you have.
. . . how far you can see through the storm.
. . . whether it’s day or night (light or dark).
. . . the heaviness of surrounding traffic.
. . . the intensity of the storm.
. . . the likelihood of other tornadoes forming nearby.
. . . the presence of flash flooding.
. . . and so on . . . and on . . . and on. Updraft Core. National Severe Storms Lab Photograph. In order to make an appropriate decision when a time of crisis comes, you have to prepare ahead of time — by learning about tornadoes and taking the time to think things through in advance. You can learn by exploring the text and links at this site. You can think about what you’ve learned by talking it over with others and picturing various scenarios, and what you would do in each one. Then you have to practice “situation awareness,” so you know when to put your plans into action. But what if this sounds appalling to you? What if you feel like you haven’t the expertise or ability to do this? What if you decide that the thing that makes the most sense is to simply learn one or two safety tips from the experts and then go on about your business? You can do that. But it won’t be “the experts” who face down the storm in your car or your office or your home. It will be you. You are the one who has to live or die with the consequences of the decision you make, not them. Responsibility may be heavy, but setting it aside is a good strategy only if you are willing to gamble on never having to face the situation in question. Depending on where you live, the risk may be low. The stakes are high. If you learn about tornadoes intellectually and experientially, you can gain enough understanding to craft a personal plan for safety that encompasses the variables you might encounter. Then you can make a reasonable decision when faced with an emergency. That still doesn’t ensure the possibility that you can survive an F-5 if it bears down on you as you’re stuck in traffic, though. So what then? How can you prepare for the possibility of being helpless in the face of tragedy? Ultimately, we are all helpless in the face of tragedy. It is the pain of being human, and it is deep, universal, and real. The great thoughts of religion and philosophy speak to this pain, and to the ways of at least dealing with its reality. Because in order to take responsibility for our own lives, we must be able face the possibility of our own deaths. To look away in fear from tragedy is to be unable to face the very things that could prevent it. Spiritual ways of knowing about tornadoes show us that they are not evil. They express a deep and powerful ambiguity that speaks to the heart of what life is. Yes, they are dangerous. Yes, they can kill. But they are the enigmatic children of the very storms that bring life-giving rain to the earth and her creatures. Nature’s power is, indeed, powerful in the deepest sense. It exceeds that of humans to a terrifying degree. It can make us feel small and helpless. If we feel small enough and helpless enough, it can make us run in fear to those we hope would save us, whether into the arms of science or of religion. This is the deep fear that Western society has yet to resolve: the fear of Nature’s power, a power that seems wanton and capricious. Tennyson wrote a poem more than a hundred and fifty years ago memorializing his dead friend Arthur Hallam. The words finds timeless echoes in most human hearts. So careless of the single life; . . .”–from parts LV and LVI, “In Memorium: A. H. H.”, Alfred Tennyson, 1850. 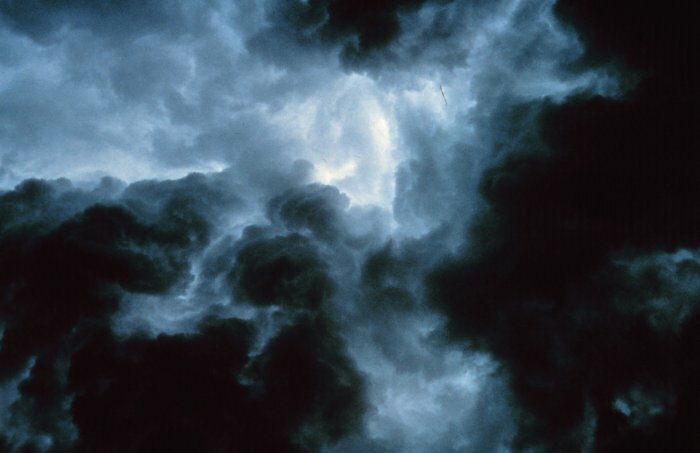 Nature — storms, disease, death — can be terrifying. For 500 years Western civilization has done its best to defeat Nature. We’ve had victories, too: antibiotics, for one thing. But now we see that some of the victories seem to have been temporary. Others come with high costs we are just now coming to understand. The question, at a time in our history when we stand on the brink of destroying the natural balance of things — and with it, our very species — is: Where do we go from here? Where is the new balance between resigning ourselves to fate and facing the worst in order to claim the best possible? How do we live with Nature, instead of against it? How do we make friends with what we’ve seen for so long as a dangerous enemy? These are the questions of the times. Their answer is the new mythos that our culture fashions even now, creating its life anew with its own hands, writing its own story even as it lives it. By taking just this one step, to learn about tornadoes and take responsibility for your own safety, you join the great human project of our day. Return to Integrated Ways of Knowing and Learning.